A quick glance at the chart listing the Safest Emerging Markets Banks might give the impression that financial institutions outside of Asia or the Middle East were excluded from consideration. All told, banks based in Gulf Cooperation Council countries (Saudi Arabia, Kuwait, Bahrain, Oman, Qatar, UAE) and Asian nations account for 44 of the 50 spots. Banks in the GCC region alone constitute close to half the list, with 23 entries. The trend of regional and national concentration of safest banks goes on. Five out of the 10 countries represented on the list are GCC members. Three Asian nations—China, South Korea and Taiwan—account for 19 banks in the ranking. 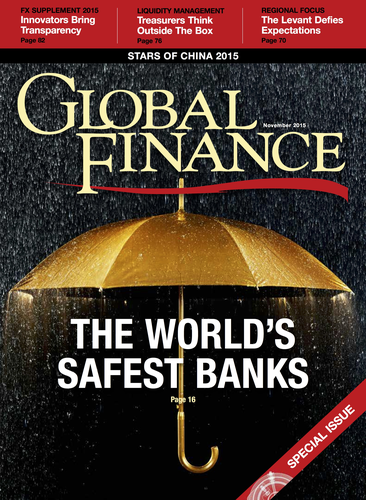 Chile and the Czech Republic are the only other countries to contribute any banks to the Safest 50. The Middle East and Asia dominated last year’s Safest Emerging Markets Banks ranking as well. The reality is, many large banking systems in emerging markets, such as those in Brazil, India, Russia and Turkey, do not come close to having financial institutions that are rated highly enough to break into the Top 50. The reason? The low sovereign credit ratings assigned to the countries. Granted, the big-three credit rating agencies—Fitch, Moody’s and Standard & Poor’s—are now taking a more nuanced approach to the relationship between the rating of a country and the ratings of banks in that country. But in practice, a bank’s rating cannot exceed its country’s sovereign rating. That’s not a problem for financial institutions in emerging markets in the Middle East, where country ratings are generally investment-grade. For the third year in a row, National Bank of Abu Dhabi is the World’s Safest Emerging Markets Bank. The company remains the only emerging markets bank to hold three AA- ratings. National Bank of Abu Dhabi also sits at number 29 in Global Finance’s overall ranking of the 50 Safest Global Banks. Not surprisingly, no emerging markets financial services company holds a rating higher than AA-. Out of the GCC countries, Saudi Arabia has a total of nine commercial banks in the top 50. The United Arab Emirates contributes six entries—five from the Emirate of Abu Dhabi and one from the Emirate of Dubai. Four banks from Qatar qualified, three from Kuwait and one from Oman. No bank from Bahrain made the cut. Two new banks broke into the top 50 this year. Qatar Islamic Bank enters at number 44, and Kuwait’s Gulf Bank claims the 49th spot in the ranking. Banks from Qatar made a big move up the rankings, thanks to credit rating upgrades by Fitch. The company hiked its ratings for seven Qatari banks in March, having reassessed the likelihood that they would be supported by the government of Qatar, which has an AA rating. As a result, Qatar National Bank rises four places to 7th, Commercial Bank of Qatar moves up eight spots to 30th, and Doha Bank climbs eight places to 39th. In Asia, nine Korean banks scored high enough to be included in the ranking. China has eight entries and Taiwan, four. Four financial services companies from Latin America cracked the list—all from Chile. The highest-scoring bank from the country is BancoEstado, which garners 20 points, putting it at number 10. Banco de Chile is three spots below that. Besides Chile, the Czech Republic is the only other non-Asian or non-Middle Eastern nation to contribute banks to the 50 Safest Emerging Markets ranking. Komerční banka grabs the number 43 spot. Rival Česká spořitelna sits in 47th place. Banks from Qatar made a big move up the rankings, thanks to credit rating upgrades by Fitch. One A rating and two of A- (scoring a total of 13 points) were sufficient to ensure inclusion in this year’s ranking of the World’s Safest Emerging Markets Banks, which was the same criteria used in last year’s rankings. Emirates NBD claims the 50th spot with a score of 12.5. Three other banks, all based in Asia, scored 12.5 points, but didn’t make the top 50 because of their asset size. The trio: Cathay United Bank and Taipei Fubon Bank, both from Taiwan, along with Suhyup Bank from South Korea. Korea Finance Corporation merged with Korea Development Bank in December and so no longer exists as a separate institution.